We offer new cabins with full bath. The cabins offer a 360ø panoramic view featuring the river, mountains, abundant birds and wildlife. The cabins are equipped with satellite television, air conditioning, heat, a mini fridge and very comfortable beds. Each cabin has beautiful mahogany paneled walls with lovely artwork. There are private decks on each cabin on which to relax and enjoy the spectacular sunsets over the river. We have twin and queen size beds available and a rollaway if needed. Check-in time is 2:00pm. Check-out time is 10:00am. Fort Smith Fly Shop offers a selection of leaders, tippets, tools, fly tying materials, and clothing. We also provide custom tied flies as well as equipment rentals. hope you have many more for the friends that we'll be sending you.' Gail and Mike, New York and Arizona. 'You take such wonderful care of your guests, and make us feel like fast friends. Thanks so much. We'll be back.' Nancy and Tom, Colorado. 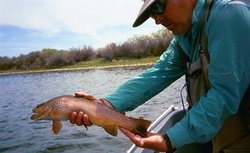 Fort Smith Fly Shop and Cabins offers complete professional guide service on the Bighorn River. Floating down the Bighorn River in a McKenzie style drift boat is one of the most pleasurable and relaxing experiences you will ever have. Enjoying the sounds of the river and its' surroundings, the views and vistas, and the learning process about the river all combine into one thoroughly fabulous adventure. We haven't even gotten to the fishing yet! Our season generally begins in March and runs through November. However, fishing is good year round on the Bighorn. The typical day starts off with a brief discussion of your goals and expectations. We want to give you the best possible experience. Our goals are safety, fun, catching fish, and trying to help people become better anglers by the end of their trip. The drift boat is used to transport you down the river and fish prime locations. Depending on conditions, we do fish from the drift boat at times. Mostly we are wade fishing - riffles, runs, tail outs and slicks. Instruction is provided on where the fish are holding and why, as well as techniques, tactics and the correct presentation to catch them. At lunch time we relax and take a break to eat and enjoy the beauty of the river, swap a few stories, and strategize about the rest of the day. We continue downstream to pursue the fish. .From Sheridan, Wyoming: Take I-90 N to Exit 530 in Lodge Grass, go left at exit and follow for .9 mile. Keep left at Stevenson's IGA across from the railroad tracks and follow the road for 5 miles. There is a small sign that says Fort Smith, take a right after the sing and follow that road for 18.7 miles to the end of it. (It is open range so be careful for animals on the road.) Go left and follow for 13.8 miles. That is route 313 south. You will see our FISH sign. Turn right into the red rock driveway and you have arrived. If you get to the town you have gone a little too far.